Business Interruption Coverage: Will You Sink or Swim? Recent catastrophic events and natural disasters go beyond the initial devastation of a business; they bring new threats and lessons to be learned. Sept 11, 2001, the United States suffered a tragic terrorist attack that led to restrictions of air travel both nationally and internationally; the access of electronic services were impaired for weeks; merchant shipments were stalled; and construction services were abandoned completely. Our Society – our world- changed that day and for insurance purposes, new coverages and exclusions to standard policies were devised. August 2004, a series of 3 hurricanes made landfall on the West Coast of Florida causing $8 billion in damages and creating over 7 million power outages that took 6-8 days to restore. October 2013 the government shutdown caused business interruption losses to industries such as tourism, hotel and restaurant services, and government contractors. 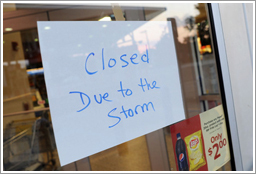 Standard Business Income/Interruption coverage is normally triggered by unintended and direct damage to property (some forms require damage to occur to property owned by the insured). However, as seen in the cases above, some business can be significantly impacted by damage to property actually owned by others. These businesses should consider the need to purchase Contingent Business Income coverage for events that could impact their normal income caused by a direct damage loss to a supplier or key customer. What lessons can we learn? Standard coverage may not be enough. Business Income/Interruption coverage is a specialized coverage that requires a comprehensive risk analysis. Ask your agent how they can help you build a strategic plan for business continuity in the event of a loss that impacts your income – one that will respond effectively for your business.